2.2 x 2.2 x 1.7 in. Special update: The Olympus AIR was awarded a Camera of Distinction in the Most Unique Camera category of our 2015 Camera of the Year awards! 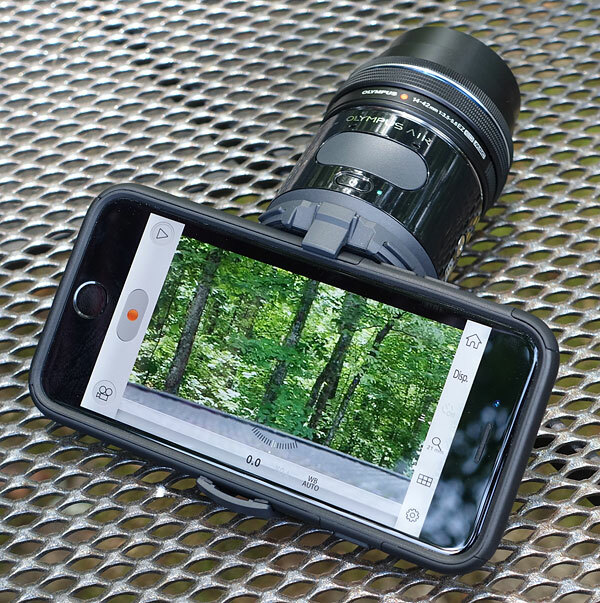 Need a customizable, wireless, interchangeble-lens-style-camera for a special project, wildlife photography, discreet street shooting, scientific or industrial application, or just to vastly improve the photographic capabilities of your smartphone or tablet? 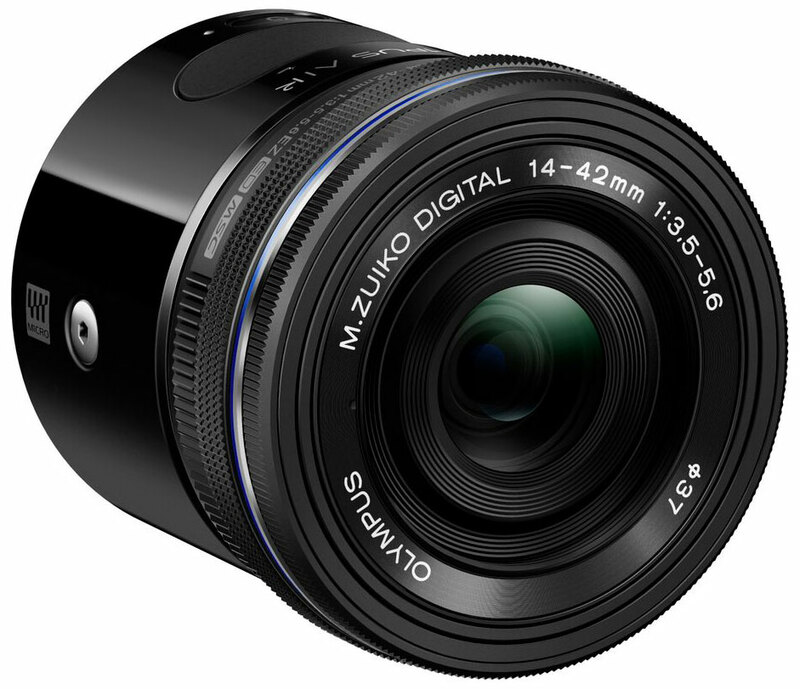 Look no further than the Olympus AIR, the company's first entry into the lens-camera category. 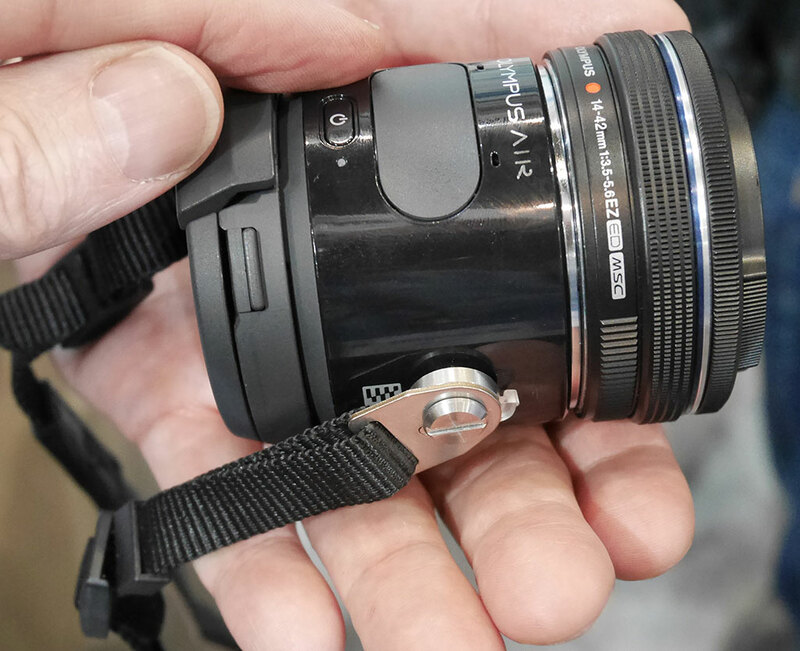 Featuring a 16-megapixel 4/3" Live MOS sensor and a standard Micro Four Thirds lens mount, the Olympus AIR A01 is essentially a fully-functional interchangeable-lens camera minus the display and most physical controls, relying on built-in Wi-Fi and Bluetooth to operate wirelessly. And since it uses the very popular micro 4/3 lens mount, it's compatible with a huge array of Olympus and Panasonic glass, as well as a number of third-party lenses. It also weighs only 147 grams or 5.2 ounces with battery and memory card, making it about 57g lighter than the lightest Micro Four Thirds camera available (the Panasonic GM1). 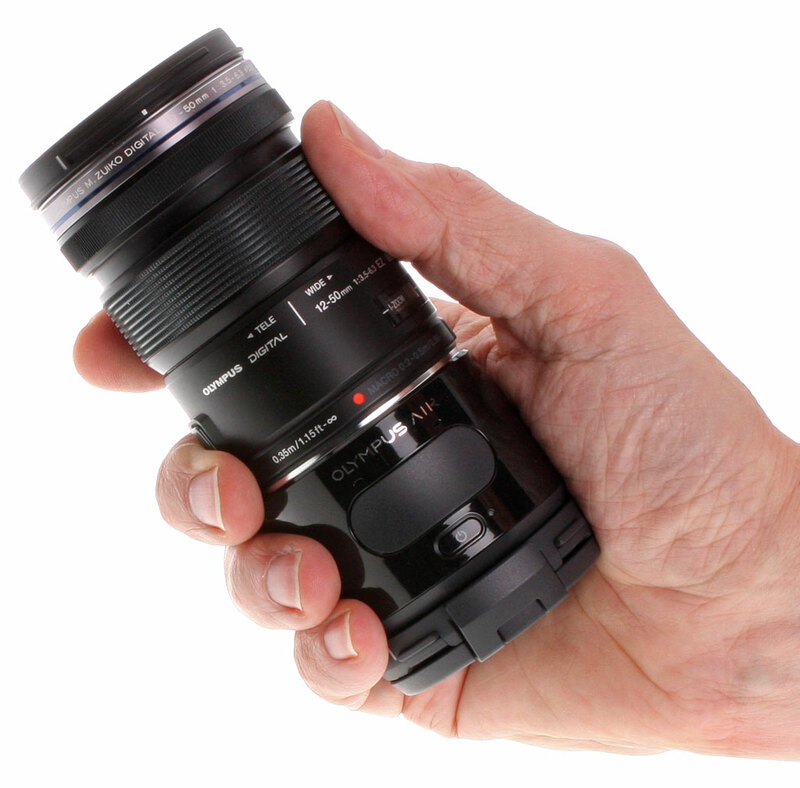 When mated with the 14-42mm EZ kit lens, the combined weight is still only 240g or 8.5 oz. Drone enthusiasts rejoice! 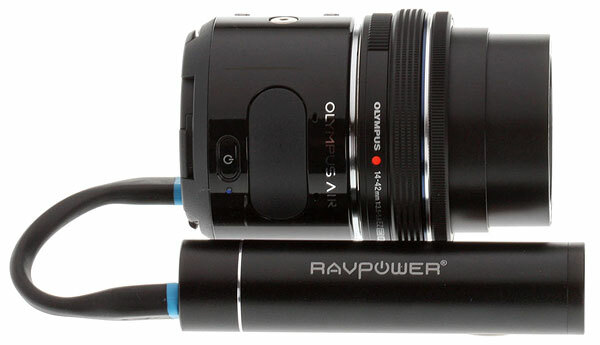 But what makes the Olympus AIR extremely versatile and "hacker friendly" is the fact that it has an open architecture, with Olympus providing an SDK (Software Developer's Kit), documentation and even physical design files for users to easily customize and control the camera for their own applications, as well as to spur innovation. Never before has a camera manufacturer so completely and officially opened a product to end-users, software developers, experimenters and system integrators. In the US, all these separate applications come bundled into OA Central; the software appears as a single app icon, rather than eight separate ones. The Olympus AIR is much more than just a hacker's camera module, though; as you'll see below, IR's own Dave Etchells had a lot of fun shooting with it; we think almost anyone who has a Micro Four Thirds body as their main camera will want the body-only version of one of these, for the flexibility and fun it brings. We think the version bundled with a kit lens is also going to bring a lot of smartphone photographers into the "real camera" fold as well. The Olympus AIR A01 went on sale in Japan on March 6, 2015, and is available in black or white, body-only or bundled with the a 14-42mm EZ lens. While no plans or pricing were initially announced for the US market, the AIR A01 is currently selling on the Olympus Japan website for ¥36,504 including tax (about US$290 as of this writing) for the body unit alone, or ¥53,784 (about US$428) with the kit lens. 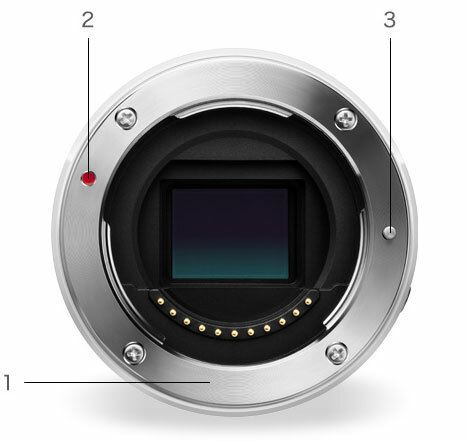 The front of the Olympus AIR A01 is pretty much all lens mount with the Micro Four Thirds bayonet flange (1), lens alignment mark (2), and locking pin (3) called out. You can also see the 4/3" sensor through the cover glass and the electrical lens contacts along the bottom. Looking down at the top we can see a power switch (1), a large shutter button (2), stereo microphone ports (3), and a status LED (4). These minimal controls allow the AIR A01 to take quick snap-shots without the assistance of a mobile device. Looking at the bottom, we see a standard tripod socket (1), the lens release lever (2), a speaker port (3), and a release lever for the AIR's own mounting flange (4). Not shown is a pair of threaded mounting points, located on the left and right sides of the barrel, occupied by little button-head screws, to keep them pristine and clean until you want to use them to attach the AIR to something. And finally on the back with the protective cover removed, we can see the accessory mount flange (1), accessory mount locking pin (2), wireless radio on/off switch (3), microSD card slot (4), micro USB port (5), and a QR code (6) along with Wi-Fi SSID, password and Bluetooth device name printed on the label. The Olympus AIR A01 includes an "AIR Coupler" accessory, which lets you mount a smartphone in landscape orientation at about a 45° angle. It supports a variety of smartphone sizes. The product images above are all from Olympus. We normally replace the manufacturer's shots with our own once we have a camera in-hand, but in this case decided to leave the above, because they were so beautifully done, but also because the details are so much easier to see on a white body than the black one we received as an eval unit. (We were given a choice of white or black, but opted to go with black for improved "stealth" operation when shooting candids.) The product shots below are all our own, though. The back of the AIR 01 is a three-layer cake, composed of the body itself, a thin protective cover, and a thicker "AIR coupler" accessory, to hold a smartphone. 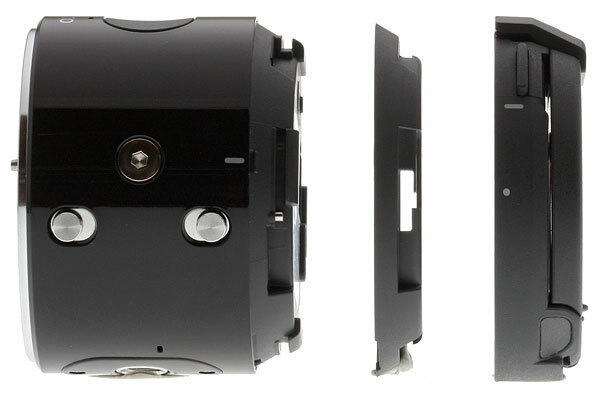 The coupler also provides attachment for the wrist strap, but serves no function other than that and holding the phone. As much as back-of-camera LCDs have improved in recent years, they still don't come close to the size or resolution of high-quality smartphone screens. We were surprised by how responsive the AIR's live viewfinder display was, relative to some other Wi-Fi-connected cameras we've worked with. 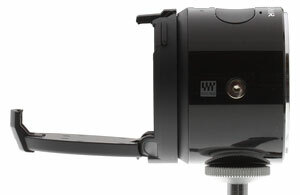 The Olympus AIR's coupler holds the smartphone at a moderate angle. We found this more ergonomic than the flat mount of Sony's QX series cameras. The AIR's coupler has two options, selected via a mechanical switch on its back. In the "small" position, the coupler can hold phones up to the size of an iPhone 6. The "large" position angles the lower gripper a bit lower, to accommodate larger smart devices. 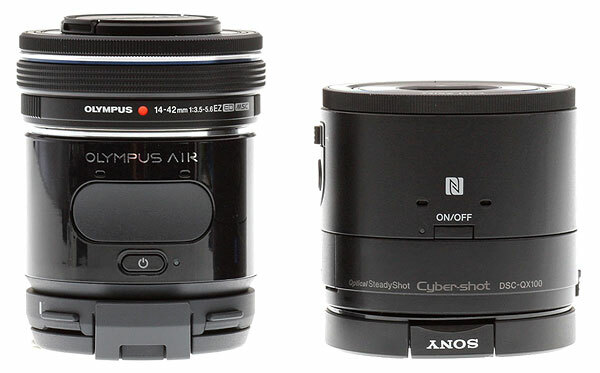 Although Sony started the entire wireless lens-camera market with their QX-series which now includes the APS-C sensored E-mount QX1 model, Olympus seems to have taken the concept a good bit further, both by being more open to third-parties and hackers, not to mention offering a richer user interface. It'll be interesting to see how the AIR A01 compares in terms of market acceptance and we look forward to seeing all kinds of creative and unique applications for it. As of this writing in late June of 2015, Olympus has finally announced pricing and availability for the AIR in the US with Amazon Cloud integration, and we've just gotten our hands on one. Read Dave Etchells' Olympus AIR shooter's report below to see why he says "The Olympus AIR is without question one of the most fun cameras I've used in years!" 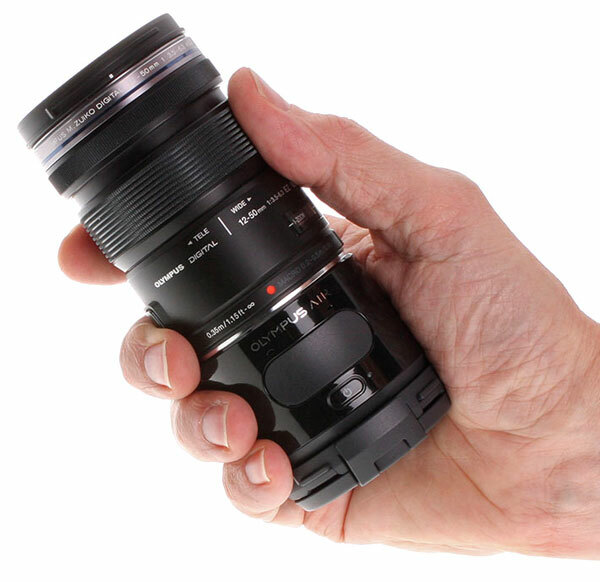 Pint-sized powerhouse: The Olympus AIR packs essentially all the "guts" of the E-M10 into a small cylinder the diameter of the lens mount. Or, are you looking for the perfect gift for a photographically-inclined family member? Do they own any Olympus lenses? Do they own a smartphone? Do you enjoy taking and sharing photos with your cell phone? 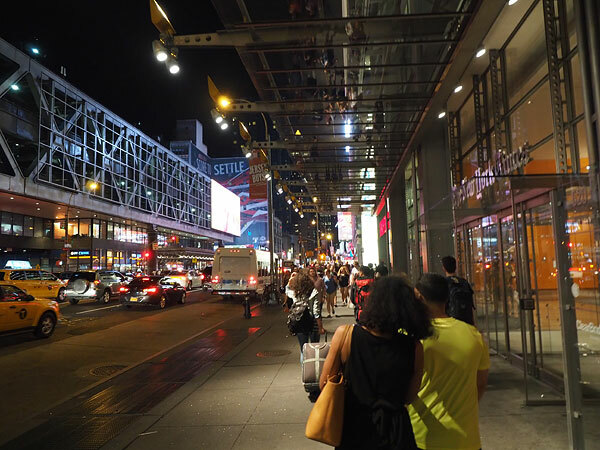 Are you frustrated with the wretched image quality, especially indoors or after dark? After more than 17 years running this website, and having been a photographer since my childhood, I like to think I have a pretty good eye for new products and how they'll play out in the market. I'm pretty good at "getting" a product on first contact, and having a good sense for who it's for, how well they'll like it, etc. 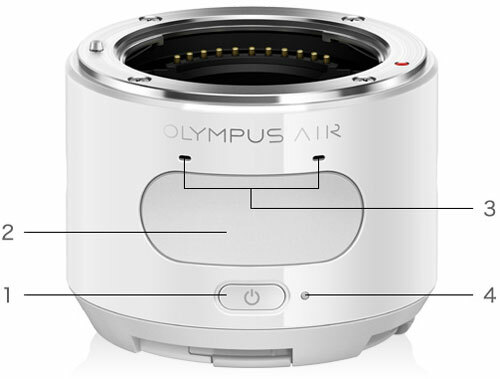 In the case of the Olympus AIR, though, I have to admit that I really missed the mark: It's going to be way bigger than I first thought. 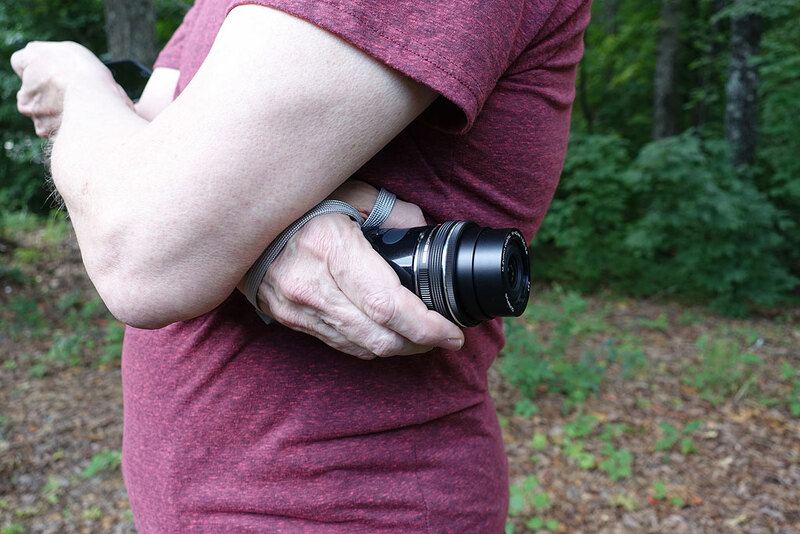 Compact companion: If you already have a Micro Four Thirds camera and lens, bringing along an AIR for fun candids, shots from crazy angles, or long-distance selfies is easy; sans lens, it's very compact. This shot compares it to the Olympus E-PL7, itself very compact. 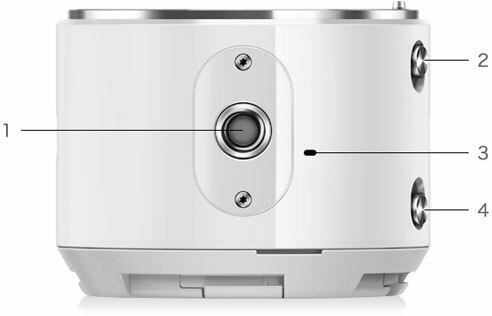 The AIR is thicker, due to its components all being stacked up behind the sensor, but is actually highly pocketable. When the AIR first soft-launched in Japan in late 2014, the emphasis was on Olympus' openness with the design, offering not only an extensive software development kit (SDK) for both iOS and Android operating systems, but providing 3D design files, making it easy for hackers to design it into larger systems. Being a tinkerer myself, I was immediately enthused for what this could mean: Here's a serious camera, with a big sensor, compact size, and excellent image quality, with an open interface, and a mechanical design literally made for being built into things! How cool is that? So it's a great gadget for hackers; which is wonderful if you're a hacker, but maybe not so much if you're an everyday photographer, right? The Olympus AIR is without question one of the most fun cameras I've used in years! Getting their cameras to work seamlessly with smartphones has been a Holy Grail for camera manufacturers for some time now, with varying levels of success. The first bugaboo to address has been initially connecting or "pairing" the camera with the smart device, making all the configuration settings necessary to do so as painless as possible for the user. The Olympus AIR does a decent job of this, although you still do need to name your AIR as a Bluetooth device and enter a Bluetooth password for it. The first step (after buying an AIR, that is), is to download Olympus's OA Central app from the iTunes Store or Google Play. When you first bring up the OA Central app, it presents a series of screens that walk you through the initial pairing process, using the QR code printed on the back of the AIR. To my mind, they do a pretty good job of this, although it's slightly confusing that there are separate passwords for Bluetooth (the one you create) and the Wi-Fi password (which is printed on a label on the back of the AIR's body itself). Really, though, I don't know that the process could be much simpler, and once the initial pairing has been done, you don't need to worry about passwords or Wi-Fi profiles again. While you don't have to worry about passwords or Wi-Fi profiles after the initial pairing, using the app does require that your phone not already be connected to a Wi-Fi network. (I don't know if this is the case with Android devices or not; it's true of iPhones, though.) 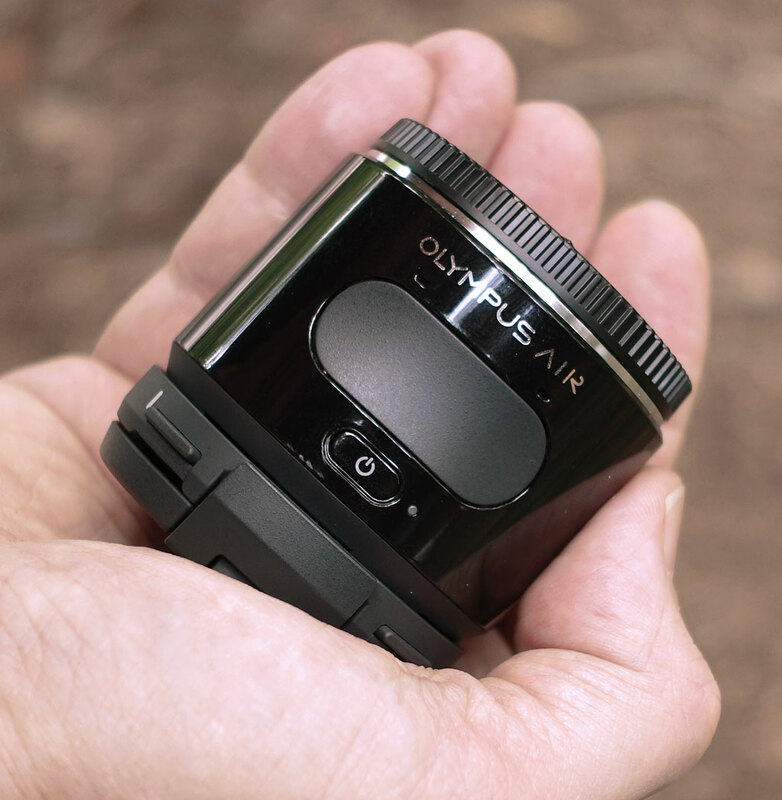 If your phone's Wi-Fi connection isn't already in use, launching the Olympus AIR application will automatically connect to the AIR if it's powered on. If your phone is already connected to a Wi-Fi network, you'll have to go to its Wi-Fi control panel and select the AIR's Wi-Fi node from the list of available networks. I understand that there's not much Olympus can do about this, but found it a little annoying to have to manually switch my phone's Wi-Fi connection off of the current Wi-Fi network when I wanted to start shooting. When I was playing with the camera at home or in the office, whenever the AIR was powered off or timed out, my phone would hop back on the local Wi-Fi network, requiring me to switch it away again when I powered the AIR back up. I did find I could avoid this behavior on my iPhones by setting the phone to ask me before joining known Wi-Fi networks. Still, that meant I needed to manually choose to rejoin the home or office network when I was done playing with the AIR. When it was first introduced in Japan, no fewer than 8 separate apps were offered for the AIR. Some of the delay in bringing it to the US has apparently been used to pull the separate applications together into a single user interface ... sort of. A Color Ring lets you adjust hues (30 settings) and saturation (8 levels). Highlight and Shadow Control (adjust a tone curve with ±7 steps). Capture a single scene of everyday life from multiple viewpoints. Select framing from 4 different patterns, and then depending on your selection, choose the number of frames or add an Art Filter. Shoot, combine, and rearrange multiple short clips into a single short movie. You can combine short clips into a single short movie of up to 64 seconds long. You can select clip lengths from 1, 2, 4 and 8 seconds. 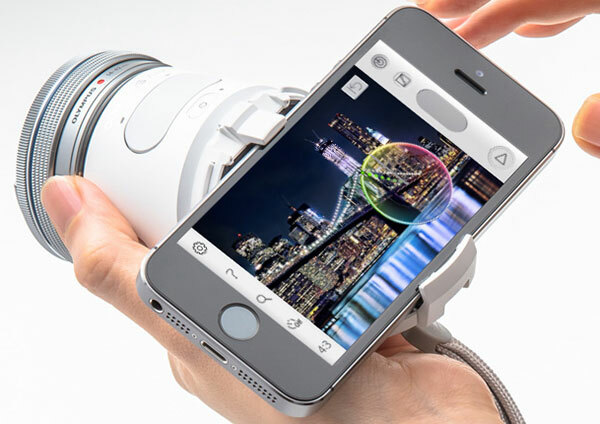 Select from 14 different Art Filters, touch the smartphone screen to focus using Touch AF, operate the zoom (with EZ lens), and use digital zoom up to 3x. Add transition effects, Art Effects, and music (default only) all in-camera. With a single release of the shutter, subjects are automatically detected and OA.Genius provides you with six different creative expressions of your single shot that suit your subject by automatically applying various filters, cropping, etc. When you find a photo you like among the six OA.Genius images, you can save the settings used to shoot that photo to your favorites. 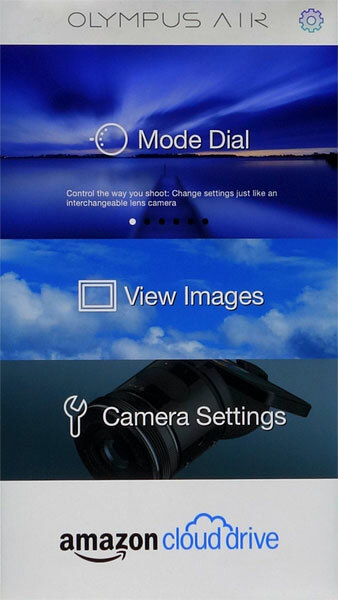 You can then pull up that setting from your favorites to shoot with the same settings. Let's for now just consider the Mode Dial option, as that's what I used in 90% of my shooting with the AIR. Touching the ModeDial pane leads to a screen that says "Searching Bluetooth", while the phone looks for the AIR you've paired it with. 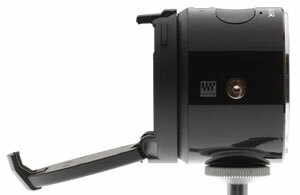 Assuming the camera is on and in range, you'll see a viewfinder display appear after 4-5 seconds. The shooting interface is clean, uncluttered and intuitive. 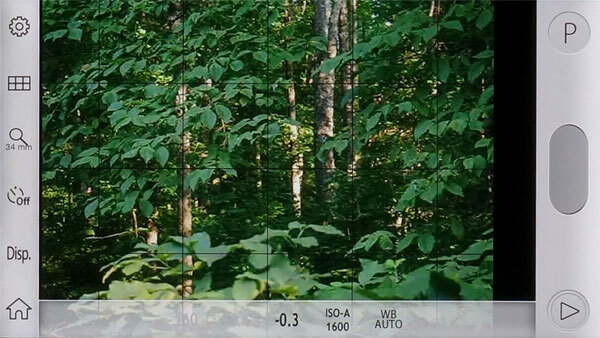 This mode defaults to Program exposure mode, showing you current settings for exposure compensation, ISO, and white balance along the bottom of the screen. Icons to take you to the home screen, adjust display settings, select self-timer, adjust zoom (with "EZ" power-zoom lenses) or focus-assist magnification level, go to a 6-item quick menu, or jump to the camera settings menu are arranged down the left side of the display. Touching the icon in the lower right corner of the screen will take you to the last image captured, and a shutter button is on the right also. The two sets of side controls stay in the same locations as the smartphone is rotated from zero (landscape format) to 90 degrees (portrait format), then swap sides as you continue to rotate to 180 degrees (landscape orientation, but with the ends of the phone swapped left-to-right). The exposure parameters always remain beneath the viewfinder image. Touching the "P" button at the upper right in the screenshot above brings up a mode menu, letting you choose between iAuto, Program, Aperture Priority, Shutter Priority and Manual exposure modes, as well as movie recording. The user interface in the OA Central's PASM mode is pretty intuitive. Touching an exposure parameter pops up a sliding, horizontal menu of options that you can just scroll along with your finger. Here, I've touched the ISO setting, and it's waiting for me to make a selection. The selection menu is ghosted slightly, so you can see the viewfinder image behind it. In this shot, I have the exposure compensation dialed down so the viewfinder image will be darker, making the menu more clear in the photo. In practice, I didn't find it too distracting to have the live view image ghosted behind the selection options. As noted, I've spent most of my time with the AIR thus far in Mode Dial mode, but did experiment a little with the others. This brings up most annoying aspect of O.A. Central, namely the time it takes to switch between major operating modes. (Including playback and the Settings menu.) I've been using an early version of the app that Olympus installed on my phones directly, since it wasn't yet available on the iTunes Store -- so it's possible that this issue won't be present in the production version. In the version I was using, though, it was clear that, while all the original separate applications had been brought together under one interface, they were still operating independently of each other. I say this because they aren't able to "share" a connection with the AIR, once established. Switching from one operating mode to another requires the app establish a whole new connection, with the 4-5 second "Searching Bluetooth" process in between. The Olympus AIR is lots of fun to shoot with! The viewfinder display is great - very responsive! I did find that my grip could affect the VF responsiveness some, by partially blocking the Wi-Fi signal; see my comments below about Wi-Fi range. Shutter lag was both good and bad news; the latter when I was first experimenting with the camera, capturing candid shots on the street. On my first outing with the camera, I pretty much just used Touch AF Shutter, and was often frustrated when subject movement or my own shaky camera-holding (see my notes below about the challenges of decoupled viewfinder and camera operation) would leave me with shots of the building behind the subject rather than the subject itself. 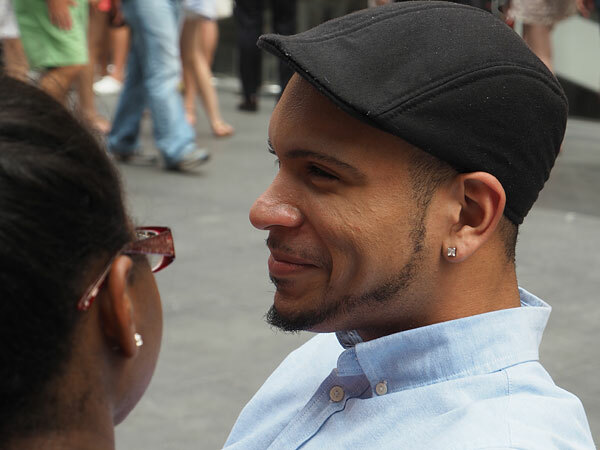 I'd like to try another round of public candids, this time using the on-camera shutter button to capture the decisive moments; I think I'd have much better success. This was where I had the most fun, although I'm afraid the results show my lack of expertise as a street shooter rather than the Olympus AIR's capabilities. Actually, I'm more inclined to call these "candid public portraits" than "street shooting", as the latter carries more of a sense of rawness and emotion than I can personally aspire to capturing. I do find people endlessly fascinating, though; I'm often poignantly aware that everyone I pass on the street has a complete life of their own, as rich as mine in joy and sadness, memories and regrets, hopes and fears ... that I'll never know. So I like "people" pictures and the character they reveal, but lack the moxie or moves to just pop a camera in strangers' faces. The Olympus AIR is great for candid photography; whether in public or with friends, separating the viewfinder from the camera means you're much more likely to get natural, unposed expressions. For me, then, the innocuous appearance (and silent operation) of the Olympus AIR was perfect for exploring candid shots in city crowds. Rather than having to face my subjects and tip them off to what I was doing, I could hold the camera crosswise to my body, angle it this way and that while appearing to simply be fiddling with my phone, or even hold it at my side, pointing directly behind me. As noted above, most of time I was doing this, I was using the Touch AF Shutter option, so I lost a lot of shots to the noticeable shutter lag in that mode. Next time, I'd use just Touch AF, and either the shutter button on the app or the shutter button on top of the AIR to grab my shots. One thing that helped me was to separate pan, tilt, and rotation. If I'd just been shooting for my own use, I wouldn't have worried about trying to get a level horizon or upright verticals; I'd simply rotate and crop the images however I wanted in post. Wanting shots to share here that'd be (more or less) OK straight from the camera, I spent a good bit of time fiddling with rotation, often with only partial success. What worked best for me was to pick out a subject, rotate the AIR in my hand until the buildings in the background seemed more or less vertical, then hold that angle and pan/tilt to frame my subject. Even taking rotation out of the picture (so to speak ;-) it was still hard to pan/tilt controllably with the camera facing backward. My solution was to do the panning by rotating my whole body, which meant my wrist only had to deal with tilting up and down. Practice makes perfect, and I only had a couple of hours to play this way in the middle of a hectic business trip, but I was getting better towards the end. I wish I could find time for some more city shooting again soon, but it's hard fitting expeditions to the metropolis in among the demands of running this site :-/ ) Another confounding factor was that I needed to keep moving. At one point, I was accosted by a cop while I was sitting on the base of a statue, trying to surreptitiously snap shots of the people around me. I was well within my rights to photograph on public ground, but I also understand the nervousness of big-city police about most anyone exhibiting unusual behavior. 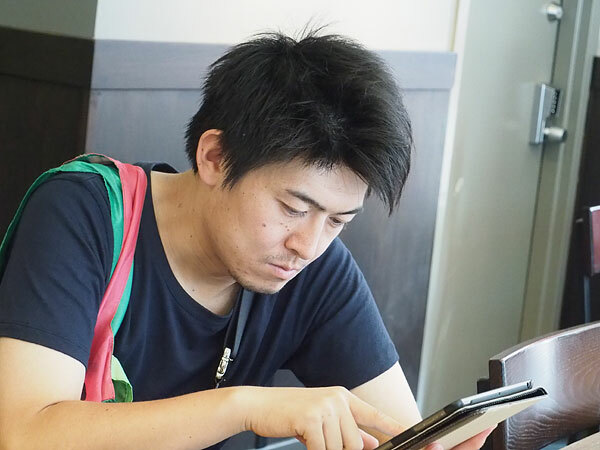 When I explained what I was doing, he said that it just "doesn't look good", and suggested that it'd perhaps look better if I was walking around vs sitting in one place. I don't know if I'm tipping off potential bad guys by sharing this, but it seems that keeping moving might help photographers avoid hassles with law enforcement. I really appreciated how easy it was to get shots from high or low angles with the AIR. 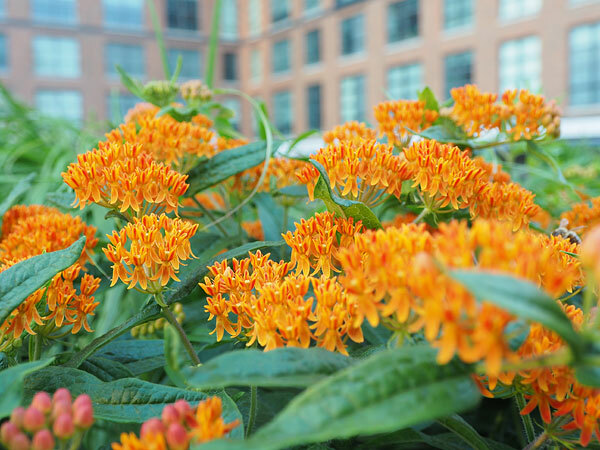 For this shot, I held the camera out away from my body and quite low, shoving it down amongst the flowers. I could have done the same with a conventional camera, but it would have been a lot more awkward, and I might have just passed the shot by. If you can point, you can shoot: NO limits on shooting angles! Prior to shooting with the Olympus AIR, I didn't realize the extent to which my thinking about possible shots was skewed by the need to keep a camera to my eye, or at least to keep the LCD screen in easy view. Sure, I've shot with plenty of cameras with tilting or even tilt/swivel LCD panels, but regardless of LCD flexibility, cameras are pretty much designed to be gripped a particular way, so it's awkward to hold and shoot with them differently. Shooting with the 12-50mm EZ lens, I found I preferred to control the zoom manually. This grip worked well, aided by the AIR's small body. With the AIR, I could simply wrap my fingers around the barrel, so it didn't much matter what position or angle the camera was in. I was using the Olympus 12-50mm f/3.5-6.3 EZ lens with it, so I could have controlled the zoom setting via the smartphone app, but found I preferred to adjust the zoom setting manually. 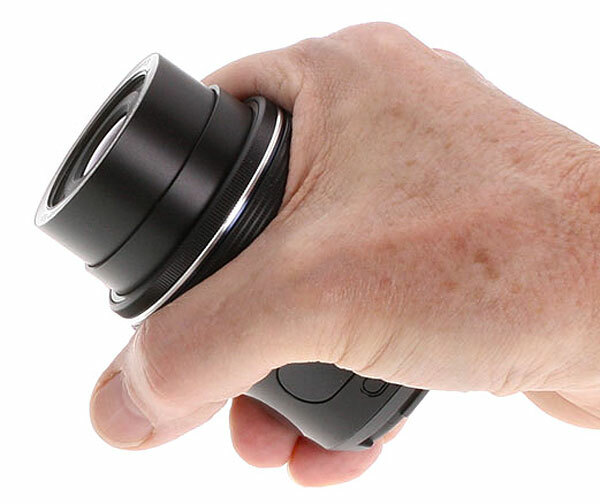 This led me to a grip where I held the body of the camera between my palm and three fingers, using my index finger and thumb to control the zoom ring. This worked pretty well, but did limit shooting angles slightly. If I wasn't operating the zoom, I'd just wrap my thumb and first one or two fingers around the barrel, and could point it pretty much wherever I pleased. Having the viewfinder in front of me regardless of where I held or pointed the camera really opened up my thinking about possible shooting angles. A little more time with the camera might further expand my awareness of potential shots, but I found it very liberating, right from the start. Given that we're talking about radio signals and antennas, it's no surprise that it made a difference which direction I had the phone pointing; the range was much better when the back side of the phone (the one opposite the display screen) was pointing at the cameras. In the first test, I had the cameras resting on a wooden step, figuring it'd be good to test them with nothing around them to absorb or reflect the signals. I tested the two cameras separately, so there'd be no question of their Wi-Fi signals interfering with each other. It's possible that Sony's latest lens-camera models have better Wi-Fi range than the QX100 shown here, but the Olympus AIR significantly outdistanced the QX100 in a Wi-Fi range test. The AIR with its kit lens and coupler attached is a bit longer than the QX100, but smaller in diameter. 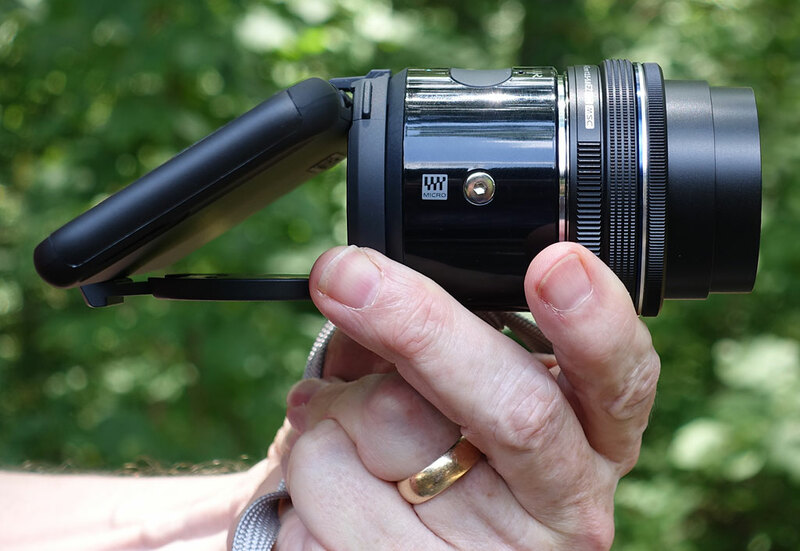 The Olympus AIR significantly outshone the Sony QX100 on this test. The Sony's viewfinder updates got pretty ragged when I was about 120 feet away, while the AIR was still going strong at 150-160 feet. With this setup, I only had a clear line of sight to the cameras out to about 160 feet, so I needed to try a different setup to really exercise the AIR's abilities. For the next test, I moved the cameras to an open grillwork metal table on a patio outside. Interestingly, the Sony did much better in this case; the metal beneath it seemed to boost its radio signal. In this case, I got out to about 140-150 feet before the viewfinder wouldn't update properly. But under this test condition, the Olympus AIR stayed connected out to as far as I could walk before coming up against a neighbor's fence, at 250 feet! Viewfinder update and control operation were starting to get a little marginal at that range, but the camera was still usable. 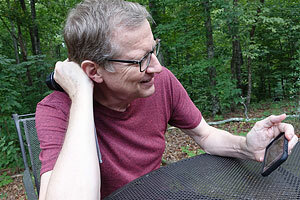 To see how it would do without a metal surface beneath it, I tried resting the AIR on a plastic garbage can about 30 feet further down the driveway. That meant I could only get about 220 feet away from it, but at that distance, the display and controls were quite responsive. Your mileage may vary, depending on the smartphone you're using, Wi-Fi congestion in the area, the orientation of the camera relative to the phone, etc, but I was pleasantly surprised by how far away I could get from the Olympus AIR and still control it. It doesn't matter too much how you hold the AIR, as long as the phone has a line-of-sight "view" of it. On the other hand, if there's a lot of interference or much of your body is between the phone and camera, the natural grip shown here tends to block too much of the Wi-Fi signal. A grip like this could make it difficult for the phone and camera to connect. Great Wi-Fi - but watch your grip! 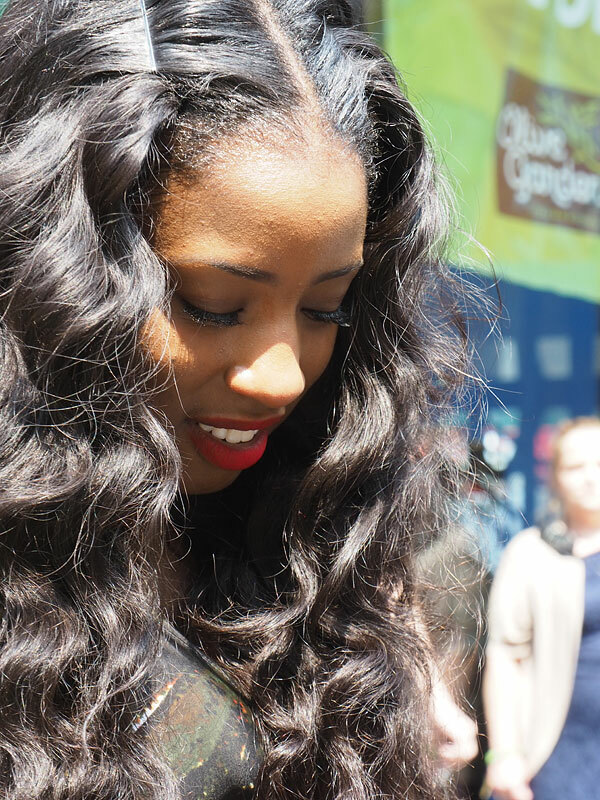 I was surprised that the Olympus AIR could transmit so far, particularly after my experience using it for candid shots in the city. As noted above, I sometimes held the camera at my side, facing backwards. Doing this, I discovered that having any part of my body between the phone and the camera would kill the viewfinder updates. My solution at the time was to just hold the phone a bit awkwardly on the right side of my body, with the camera in my right hand. Later, I discovered that I could get better results when holding the camera in my left hand, or simply by not encircling it as thoroughly with my hand and fingers. I guess it makes sense, given that there's a radio and itty-bitty antenna inside, but it's definitely something to be aware of. If you're holding the AIR in your hand and think it's not working properly, try giving it a bit of "air" by not surrounding it with your hand and fingers. For my first outing with the AIR, I had it with me over the course of a full day, but probably had it powered up for less than two hours over the course of it. By the time I was done with dinner and heading back to the hotel, the battery indicator was down to one bar. The AIR's battery life is CIPA-rated for 320 shots per charge according to the Olympus Japan website, which is reasonable for its size. Olympus doesn't provide battery life rating for recording video, but when I tested it by having it continuously record standard HD at the low quality setting, a fresh charge lasted a bit under two hours (110 minutes, to be exact). By way of comparison, the Sony QX1 APS-C lens camera's battery is CIPA-rated at 440 shots per charge, up to 150 minutes for video, and it's user replaceable. Still, the AIR's battery life is on par with a lot of compact cameras, but what if I wanted to actively shoot for four or five hours? If the AIR had a removable battery, I'd say no problem; I'll just have one or two extras, and swap them out as needed. But what do you do with a fixed battery? You can't very well carry a charger around with you, can you? 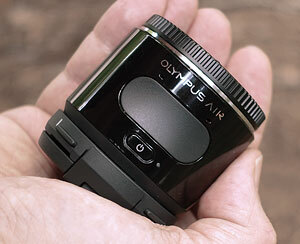 The Olympus AIR has a built-in battery, meaning you can't just swap batteries when it runs out of juice. An inexpensive USB battery pack like this one can keep it running or recharge it pretty quickly, though. A possibility that intrigues me, but that admittedly applies only to people with access to a 3D printer, would be to devise a battery-clamp that would hold a compact battery like the little tubular one shown above snugged alongside the AIR. You'd no longer be able to wrap your fingers around the device, but the battery attachment itself could become a grip. While Olympus decided to not include their (excellent) sensor-based image stabilization in the AIR, for the sake of keeping it as small as possible, I was surprised at how usable some of my night-time handheld images were. The one above was not only hand-held, but I was holding the camera at full arms-reach overhead, while walking slowly. There's a little motion blur there, but way less than I would have expected. You can probably tell I'm a pretty big fan of the AIR, on a lot of fronts. It's just so much fun to play with! It's far from a toy, though, delivering real photos with excellent image quality. Don't get me wrong, I don't see it being a primary camera, at least not for the enthusiast crowd, and it wouldn't remotely replace a PEN or OMD as my primary camera. If I owned pretty much any Micro Four Thirds camera, though, I'd buy an AIR in a heartbeat. For more casual photographers looking for a partner for their smartphone, the AIR's pretty hard to beat as well. Olympus needs to better integrate the different pieces of OA Central, so you don't have to wait through a camera-connection process when switching modes, but if they can do that, I think the AIR could find a lot of happy homes with phone-photographers looking to up their game with better image quality and more flexibility. It would also make a perfect bridge for such photographers into the world of interchangeable lens cameras. Sensor. 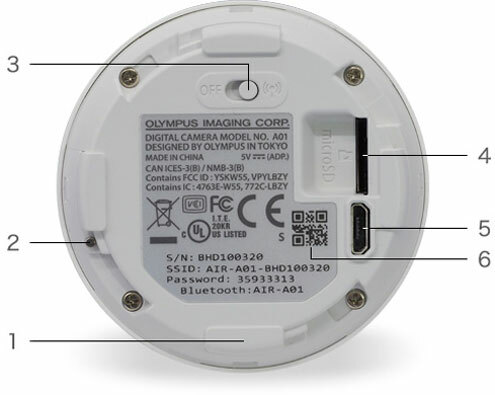 The imager used by the Olympus AIR A01 is a 16-megapixel 4/3"-type Live MOS sensor. 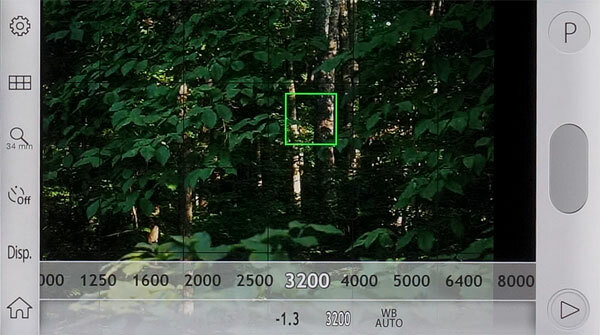 We're told that it's the same sensor (and image-processing chain) as was used in the Olympus E-M10. We haven't heard whether the AIR has a low-pass filter or not, but we suspect not, as the E-M10 didn't have one either. Total pixel count is 17.2 megapixels with 16.05 megapixels effective. 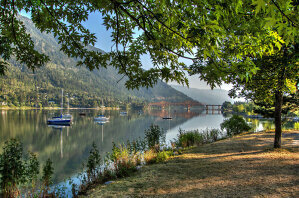 Maximum still image size is 4608 x 3456 pixels with JPEG and 12-bit RAW formats supported. Available aspect ratios are 4:3 (native), 3:2, 16:9 and 1:1. Processor. Output from the image sensor is handled by a TruePic VII-branded image processor, the latest generation used in Olympus Micro Four Thirds cameras like the E-M5 Mark II, E-M10 and E-PL7. Optics. The A01 features a standard Micro Four Thirds lens mount, and should also accept Four Thirds and many other lens types via optional adapters. 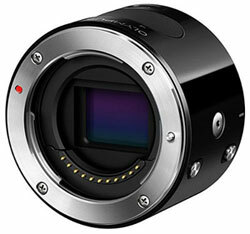 Click here to read Olympus A01 tech info!